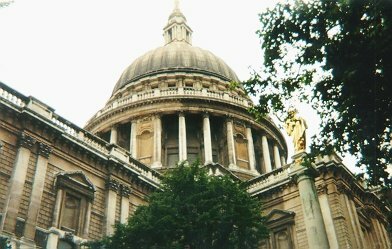 St. Paul's Cathedral was built in the late 17th century to the design of Sir Christopher Wren. It followed earlier churches which had been on the site since 604. 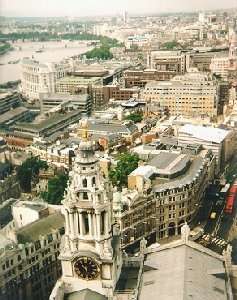 It is the Cathedral of the Diocese of London and there has been a Bishop of London since at least 314 A.D. In addition to the main floor there are views from the galleries, and, in the crypt, lavatories, a cafe' and shop which are open 9:00 to 17:30 Monday to Saturday and 10:30 to 17:00 Sundays, together with monuments and memorials to many famous people. We first walked around St. Paul's churchyard and took some (a lot) of pictures. We then entered the Cathedral. The photography is not allowed inside. The cathedral is amazing. Although it was a bit strange for me, as a Jewish girl, to walk around a church, the decorations and the architecture were beautifull and I enjoyed my look-around. The massive monuments just amazed me with their tiny details. After a walk around, we went up up up up the stairs to the Dome & the Whispering Gallery. I think I haven't climbed so many stairs in my life!! We had to stop once in a while to rest our legs a bit. But finally, we did reach the Dome and the veranda. We went down again to the Crypt, where there are tombs of famous people (like Christopher Wren, who designed St. Paul's), the OBE Chapel, the Treasury, The shop, the cafe' and the exit.